We present a comprehensive company search offering, with quick links to ASIC, PPSR and AFSA Bankruptcy Searches for increased efficiency. Should you need to order both an ASIC extract and PPSR extract together, usually four separate searches need to be undertaken, however, InfoTrack allows you to order all four searches in one easy step without the need to access separate areas of the system, thus saving you substantial time. We also have access to CreditorWatch, AML (Anti-Money Laundering) Reports and Litigation Searches. Access to ASIC which will provide you with information on companies, business name searches, SMSF, persons, documents and more. Full access to the PPSR which includes Organisational Grantor Searches, Secured Party Groups (SPGs), Serial Number Searches and more. Access to the Combined ASIC & PPSR Report. 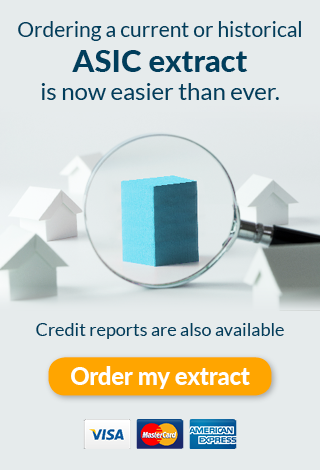 InfoTrack's Company Overview & Credit Status report combines your ASIC Extract with a Creditorwatch Report for deeper due diligence. Data visualisation available for AFSA, PPSR and ASIC results through REVEAL.